The largest inland water body in the United Kingdom, Loch Lomond lies within the council areas of Argyll & Bute, Stirling and West Dunbartonshire and has an area of 71 sq. km (27.4 sq. miles) and a shoreline length of 96 miles (153 km). Extending for a total length of 24 miles (39 km) from Ardlui in the north to Balloch in the south, and although narrow to the north, the loch widens in the south, where the majority of its 38 islands can be found. These islands include Inchmurrin, Inchcailloch, Inchmoan, Inchtavannach and Inchlonaig. Loch Lomond also provides drinking-water to Glasgow and Central Scotland, with the height of the loch controlled by the River Leven Barrage. Abstraction was initiated in the 1950s, but extended in 1971 to provide up to 455 million litres (100 million gallons) of water per day. There are nineteen species of freshwater fish in the loch, including the larger of only two natural populations of powan (Coregonus clupeoides) which are unique to Scotland. These fish share the loch with various birds and mammals including otters, Greenland white-fronted geese and red-throated and black-throated divers. 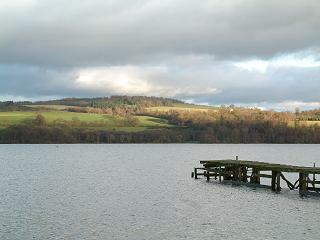 The main villages of the loch are Balloch, Balmaha, Luss, Tarbet and Inveruglas. Cruising the loch on pleasure steamers has been a major draw for tourists since 1818, when David Napier brought his Marion up the River Leven to the loch. The last paddle-steamer, the Maid of the Loch has been permanently moored at Balloch Pier since 1981. Its proximity to Central Scotland still makes it a popular centre for day trips, and the loch offers opportunities for watersports, fishing, golfing, walking and camping. It is now the focal point for Scotland's first National Park, the Loch Lomond and Trossachs National Park, which covers an area of 1865 sq. km (720 sq. miles) with a retail, leisure and visitor centre at Loch Lomond Shores. The loch was the venue for the open water swimming events during the 2018 European Championships. Around Loch Lomond are some of the most accessible glacial landscape features in Scotland, including corries, hanging valleys and drumlins. Evidence of the Loch Lomond Readvance (or Stadial), a period of renewed glaciation occurring around 10,500 BC, can be seen at the southern end of the loch.